개 꼬리 삼 년 두어도 황모 못 된다. Literal meaning: Even if a dog’s tail is kept for 3 years it will not become a weasel’s fur. What it is really trying to say: One can’t make a silk purse out of a sow’s ear – be unable to turn something ugly or inferior into something attractive or of value. 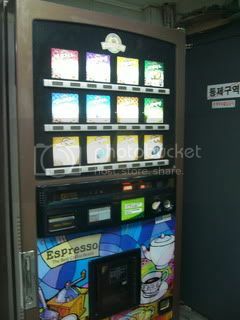 The famous vending machine from Boys Over Flowers, where Jan-di bought Jun-pyo a cup of “priceless coffee”. Actual location? Cable car station at Namsan Tower. 나비는 반드시 자신의 힘으로 고치의 껍질을 깨고 나와 야만 한다. 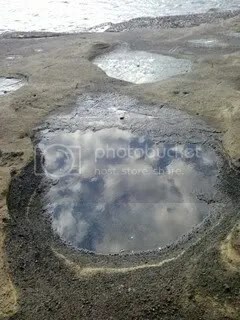 Love how the sky is beautifully reflected in the puddle of water at Yongmeori, Jeju island (a rock formation in the shape of a dragon’s head). Literal meaning: Put the sickle and don’t know the name of the first letter of the Korean alphabet. What it is really trying to say: Be so arrogant as not to know his ABC. / Do not know A from B = Utterly illiterate.